A live art participatory installation in the Strongrooms courtyard celebrating International Women’s Day. Inspired by Virginia Woolf and in support for equality in spite of gender and mental illness experience, we have successfully crowdfunded to raise money to build an immersive installation designed to engage and champion the right for a safe inclusive space for all. We would love for you to join us on Sunday 8th March with your pens, markers and stencils and take part in this installation. Make your mark on A Room Of One’s Own. From 2pm – 10pm, Strongrooms, 120 Curtain Road, EC2A 3SQ. A heartfelt thank you to all who helped us reach our fundraising target – we are so appreciative of your support. Over 80 years ago, Virginia Woolf wrote, “A woman must have money and a room of her own if she is to write“. She spoke of financial independence and intellectual freedom at a time when women weren’t allowed to earn for themselves or even visit a university library without the stewardship of a man. Today her words carry just as much as weight as when they were first published. Though conditions for women may not be as extreme now as they were then, there are still vulnerable and marginalised members of society who struggle to exercise their freedom of expression. The ‘Room’ is not limited to a rented out flat with a key and lock. The Room has become a space. A space where one is safe. Where one can be creative. Where one can be at peace. Throughout her life, Virginia Woolf fought not only against a misogynistic society, but also against bouts of depression and sexual abuse as a child. At the age of 59, she committed suicide. We want to celebrate Virginia Woolf and the Room that she created. A Room free of gender roles and free of the stigma of mental illness – ultimately a Room celebrating freedom of the mind. 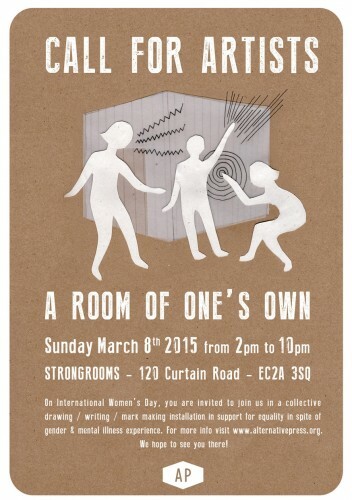 On International Women’s Day (IWD) March 8th, we will be constructing a 2.5m x 2.5m x 2.5m translucent cube in the cobbled courtyard of the Strongrooms bar in East London. The light and ephemeral structure will begin the day as a ‘blank canvas’, a symbolic manifestation of A Room. Artists and visitors will be invited to respond to the essay by drawing and writing on all surfaces of the cube. The aim, by the end of the day, is to have every surface covered with imagery and thoughts, culminating in a collective voice that champions everybody’s right to a safe, inclusive space. Though the event is only for a day we would like A Room of One’s Own to continue its journey to a more permanent location. The cube will be made from polycarbonate, which can be perfectly re-appropriated as a greenhouse, and we hope to donate it to a community-led organisation to be housed in a space open to the public. We are asking for financial help so we can inspire and engage those that visit us throughout the day with an art installation. We believe in the power of engagement and it’s ability to frame debate. We want to invigorate participants with ethical design; with concepts that have meaning and purpose and that aren’t just a flight of fancy. We believe that A Room of One’s Own not only reawakens a great essay that is as timely as when it was first written, but also encourages a collective voice within the community itself.